This book certainly resonates with me on a very personal level. Not long before I began my quest to play the Top 100 Larry Berle completed his own Top 100 journey and wrote a book chronicling his adventures. In the fall of 2007, when I was a mere five courses into my Top 100 odyssey this book was recommended to me by a friend. It’s a fun and easy read that gives me a little inspiration to keep after my goal even when the odds were stacked against me. 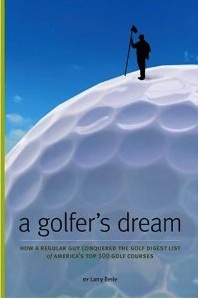 I bought this book after Top100Golfer shilled it on his blog and felt totally ripped off. The book is poorly written and does little to describe the golf courses he played. It is totally disingenuous and discrediting for you to shill the book. I assume promoting the book is payback for Mr. Berle’s facilitating your access to some courses. Bob, Thanks for the comment. I agree that the book is not a description of the courses, I don’t think it was intended to be. What I took from this book is more of the personal side of the Top 100 adventure. Larry writes more about the people he met along the way of his Top 100 quest and how he actually accomplished his goal than the golf courses. I found it to be much more of a human interest story than a book about golf courses. Larry and I are friends and he did facilitate an intro to someone who has hosted me, but I certainly wouldn’t “shill” his book if I didn’t think it was something interesting. For $15 I think it’s a fun read. I read this book a couple years ago when I learned about multiple people taking this quest to play the top 100. I thought it was a fascinating story about the challenge of getting on 100 mostly private, some extremely so, courses. Great read. Lighten up Francis. I am sorry you feel the way you do about my book. There are so many places where you can read description after description of these courses, that I felt it would be redundant to describe them yet again. Those interested in this quest, want to know how I did it, what my experience was and what Iearned from this 10 year journey. You obviously were looking for something else.